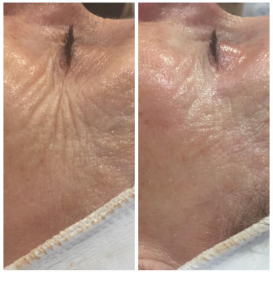 Radio Frequency technology results in extremely effective non-invasive skin tightening and firming of loose, sagging skin and has become the celebrity treatment of choice to retain a youthful glowing skin. Radio Frequency utilises waves of energy to tighten skin fibres and promote collagen synthesis offering immediate and long lasting results. Radio Frequency can be performed on any area requiring skin tightening including face & neck, upper arms, buttocks, stomach and thighs. For maximum benefit a course of 6 treatments are highly recommended followed by a maintenance treatment every 4-6 weeks. Our skin treatment includes the full face and neck. The decolletage area can be added at a small extra cost. We recommend 6 treatments taken once or twice a week with the results of the treatments lasting for up to two years. Maintenance treatments are advised every 4-6 weeks and can be combined with your regular Dermalogica or CACI facial or taken as a stand alone treatment. Any area of the body can be treated with our most popular body treatment being the back of legs and buttock area; achieving a smoother, tighter, firmer appearence to the skin and lifting the area. Treatment time: 60 mins – £120.